The no-frills Lades 2 presents diners with that age-old question: what to eat first, the chicken or the eggs? This restaurant – a Turkish version of the American-style greasy spoon diner – specializes in all things fowl, from chicken soup, to a variety of egg dishes and even a dessert that, we kid you not, weds a thick, milky pudding with chicken. Even the name – “lades” means wishbone in Turkish – follows the chicken theme. Lades 2 is located on a side street off the busy pedestrian-only Istiklal Cadessi, in a lively area filled with cafes and small nightclubs specializing in Turkish folk music. Across the street is the original Lades, a more respectable joint that serves classic Turkish food to a busy lunch crowd (and worth a visit in its own right). Lades 2 has a more proletarian vibe, with tables of mostly unaccompanied men scarfing down their food in a kind of monastic silence, broken only by the waiters shouting to the two short-order cooks in the back. The menu is basic. If it’s chicken you want, you can order the restorative soup – not far off from what you would get in a Jewish delicatessen in New York – which comes with little strands of noodle floating in it, or “tavuk yağda,” a stir-fry of shredded chicken and hot green peppers in a tangy tomato sauce. Eggs come two ways: fried or scrambled with sautéed onions, green peppers and tomato in a dish called menemen. 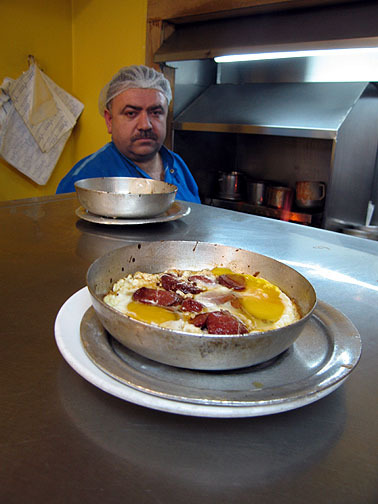 Most patrons order their fried eggs cooked together with either sucuk (a garlicky Turkish sausage) or pastirma (dried cured beef) and even ground beef. It’s greasy goodness, served up in its own individual skillet. Of course, no visit to Lades 2 would be complete without a taste of their excellent “chicken” pudding, called tavuk göğsü (literally “chicken breast”). You won’t be biting into chunks of bird in your pudding. Rather, the meat is poached and then pounded until it is nothing but wispy fibers, adding texture and the subtlest flavoring to the white pudding, which is served with a dusting of cinnamon. Don’t be scared about ordering it. After all, you know what they do to chickens in Lades 2. Apr 1, 2010 : Istanbul Eats » Happy Birthday Istanbul Eats!